Yesterday I was ready to get some changes into master, so I merged in the latest and opened a PR. But NO, the build on my pull request broke. gah! someone added more tslint rules, and this one doesn’t have an automatic fix. Maybe someone upgraded tslint, its “recommended” ruleset changed, and bam, my build is broken. /** oh no! This JSDoc comment is not aligned perfectly! * The world will end! Break the build! Look, I’m all for consistent code formatting. But I refuse to spend my time adding a space before fifty different asterisks. Yes I know I can do this with fewer keystrokes using editor acrobatics. I refuse to even open the file. You know who’s good at consistency? Computers, that’s who. You want consistent formatting? Make a robot do it. So I made a robot do it. In our Software Delivery Machine, we have various autofixes: transformations that run on code after every commit. If an autofix makes a change, the robot makes a commit like a polite person would. No build errors, just fix it thanks. I wrote this function, which does a transformation on the code. The framework takes care of triggering, cloning the repository, and committing the result. You can do this too. You can do it on your local machine with the fully open-source Local Software Delivery Machine. Fix your code on demand, or in response to each commit. Write your own functions to keep your code looking the way you like. Never be embarrassed by the same mistake again! To help you try it out, I added my autofix to an otherwise-empty Software Delivery Machine. 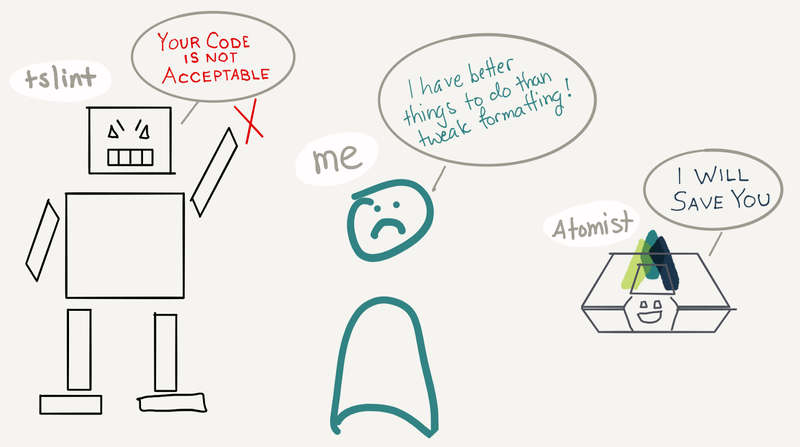 Start up your SDM: atomist start --localThe SDM is a process that hangs out on your computer waiting to help. It swings into action when triggered by the atomist command line, or by commits inside $ATOMIST_ROOT. Optional: in another terminal, run atomist feed. This will give you a running summary of what your SDM is up to. Now screw up some formatting. I’ve left some nice jsdoc comments in lib/autofix/alignStars.ts; move those stars over a little. Check your commit history: git log. Did Atomist make a commit? Check its contents: git show and you should see the stars moved into alignment. OK that was a lot just to format some comments. The important part is we can write functions to realize policy. If a person complained about this formatting I’d tell them to f*** off or fix it themselves — in fact I did curse extensively at tslint when it gave me these errors. Tslint didn’t care. Programs aren’t offended. If I want my teammates’ code to conforms to my standards, it’s rude to ask them to be vigilant about details. Aligning asterisks — I mean, some people like it, and that’s fine, I kinda enjoy folding laundry — but as a developer that’s a crummy use of my attention. Computers, though! Computers are great at being vigilant. They love it. My Atomist SDM sits there eagerly awaiting commits just to dig around in those asterisks in the hope of fixing some. Please make my star-alignment into a code transform that’s useful to you. I went with plain string parsing here, in a very functional style for my own entertainment. We also have clever libraries for working with the compiled AST and more (watch this space). There’s more: an SDM running in the cloud listens to GitHub (GitLab, BitBucket, GHE) and applies autofixes to everyone’s commits. And code reviews. And runs or triggers build (but only when it’s worthwhile; it looks at what’s changed). And initiates deploys (except it asks us first in Slack). There’s no setting up a pipeline for a new repository or branch; our SDM knows what to do with a code push based on the code in it. There’s more: an SDM in the cloud also listens to issues, pull requests, builds, deploys, and other events in the software domain. It can react to all of them by talking to people in Slack, or running any other program. Whatever we do that is boring, we can automate. This is our power as software developers. We don’t need someone to write a GUI we can click in. We don’t need to configure in YAML. We can specify what needs to happen declaratively in code. All we needed was a framework to do the common glue-y bits for us, like triggering on events, cloning repositories, passing our functions the data they need and carrying out our actions. The autofix in this example triggers on commit, clones the repository, passes a Project object in for a code transform function to act on, commits those changes and pushes them back to where I’m working. The framework of the SDM lets me define my own policies and implement them in code. Then the machinery of the SDM keeps them running, locally (open source) or team- or organization-wide (using Atomist’s API). Aligning the stars is only the beginning.